The gutter was full of debris, and DH did NOT want to climb on the ladder. It was so full of crud that now we had dampness in the basement. OMGosh, what next! I promised DH that when I came home from work I would climb the ladder if he held it. But the rest of the morning I was praying REALLY HARD that some miracle would occur and I wouldn't have to climb. My prayers were answered! 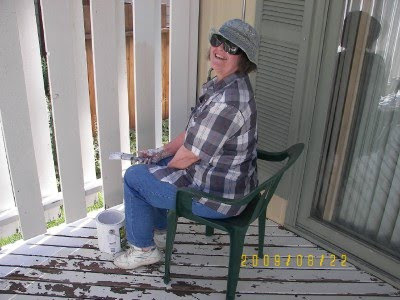 That morning, DH called the Retired Senior Services and they found us a helper named John, who came immediately, and scampered up that ladder and cleaned out the gutter. He asked for $20.00. I would have happily paid him MUCH MORE if he had asked! 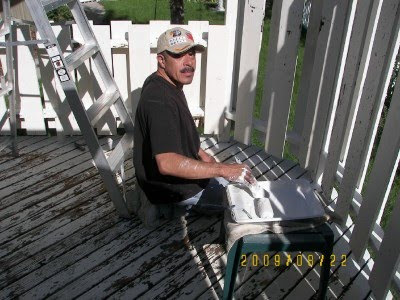 We lined him up for the next job, painting the DECK! I have never shown anyone our deck because for the past 2 years it looks so bad, we don't even sit outside any more. The fix required 1) power wash; 2) primer, 3) paint. (It really needs to be totally replaced, but ... remember the stock market thing!) And even when 'fixed' it's nothing to write home about! The first power washer didn't touch the old paint, so we dragged it back to the hardware store, and ordered a heavier power washer which was more successful. 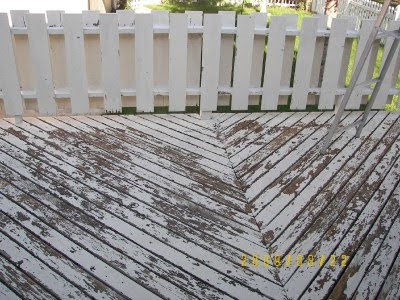 Here's what part of the deck looks like after the power washing - lovely, huh?? -- flakes/chunks of paint everywhere, and we can't possibly get off all the loose paint due to that ridiculous deck/rail design, and years of old paint. And look how one has to paint that awful rail!!! I can barely squeeze a paintbrush in there! More scraping - Ugh! I did my part with the scraping, but John did most of the work. John was a great worker and I'm definitely appreciating his assistance. After 3 hours, I was drained and couldn't work any longer. Monday, we'll start again. So that is why you couldn't come to the quilt show. Wow, what a job. Glad you had a good helper as it makes nasty jobs go faster. What a great resource to help you find John. I agree with Joyce-he looks too young to be a retired senior! It's always nice to have helper! And you will soon be enjoying your spiffed up deck! I am a true fan of color stain instead of paint and anytime I build something new I insist on color stain - no scraping and you just stain over if it fades over the years. But, right now our house has multiple layers of paint from previous owners in which case - there is nothing to do but bite the bullet and do what you are doing. I think I will put it off for another year!... maybe you can send John to me when you are done!? I think your deck looks great even in its pre-primer state (of course I am used to endless remodeling jobs) and will look so great freshly painted. glad you found some help. I HATE to paint!! What a major under-taking, but you will be happy with the result. I promise to have aching muscles for you tomorrow. I agree...sunglasses are a must for me anymore. I cannot stand any type of glare in my eyes! What a lot of work but you are going to love having it look wonderful again. I am sure that you are going to love having that space to sit outside and enjoy. It is nice to find a great helper too. Glad you did not have to climb the ladder to clear the gutters. I think your star struck quilt is going to be fabulous too- scrap quilts are so much fun and you do a terrific job of them. Paint covers a multitude of sins. I'm sure the deck will look great after you're done. Maybe it would be easier to rent a paint sprayer, especially for the railing. BTW - after-cataract-surgery sunglasses? Did you have cataract surgery? I'm facing the same thing so I need moral support. Tell me it wasn't awful - I'm such a wimp. Well, at least you are smiling in that picture! You look kind of cute to me! oh I need a John man too.